Overview - An epic historical action film about King Naresuan the Great, who liberated the Siamese from the control of Burma, changing the destiny of a nation. Part 1 depicts Naresuan's boyhood when he was taken hostage by Burmese King Bayinnaung to keep the vassal Ayutthaya Kingdom subservient. During this time, he was a novice Buddhist monk under the tutelage of the wise father-figure monk Sorapong Chatree. Part 2 portrays Naresuan as a young adult prince, already a formidable military strategist, as he leads his army on exploits against breakaway kingdoms for King Bayinnaung's successor, King Nonthabureng, and eventually breaks away to declare sovereignty for Siam. Based on real historical events, 'Kingdom of War: Part I & Part II' is an epic motion picture from Thai filmmaker Chatreechalerm Yukol. A follow up of sorts to his 2001 effort 'The Legend of Suriyothai' the two films tell the legendary story of Prince Naresuan, who would one day become a great king and free the Siamese from foreign control. Part I details Naresuan's childhood and Part II deals with his rise to power and march toward war. Both titles offer some amazing art direction with impressive set design and costumes, but unfortunately, both also suffer from pacing and scripting issues, which keep this mammoth undertaking from truly succeeding. The first film follows the young Prince Naresuan as he is taken prisoner by King Bayinnaung of Hongsawadi as a sort of bargaining chip to keep peace between his kingdom and the Prince's realm of Ayutthaya. 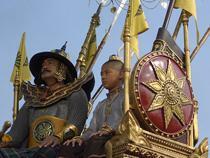 While under King Bayinnaung's care, Naresuan is trained by monks in the ways of war and peace. There he forges a deep friendship with an orphaned beggar called Bunting and a young temple girl named Manechan. The relationship between the three forms the heart of the story, and we follow the group as they get into trouble and learn from their mistakes. All the while, various complicated political maneuverings are made between the numerous territories subservient to King Bayinnaung that lead to several battles and grabs for power. The performances themselves are good, and the three main child actors bring a nice level of authenticity to their roles. While their story, focusing on monk training and cockfighting (yes, one of the main conflicts in this film involves the three children trying their hand at cockfighting) isn't exactly the most compelling material, the film is most effective when focusing on them. Beyond the actual story, set design and art direction are the real selling point, and what the production team is able to accomplish is simply stunning. Temples, palaces and battlefields are all painstakingly recreated from various historical documents with amazing attention paid to detail. Battle sequences are also realized with a strong sense of scope. The action itself, however, isn't all that gripping, since few of the main characters are actually part of the various encounters, leaving little for the audience to invest in. The main issue with the film as a whole is its pacing and focus on political intrigue over character. At nearly three hours in length this truly is an epic and does indeed drag at times. Long stretches amount to little more than scene after scene of kings and leaders meeting in palaces to discuss strategy and politics. Since the film is based on historical events, this attention to factual detail is admirable but still regrettably dull. It can also be extremely challenging to keep track of all of the major players involved and all of their various convoluted motivations. In fact, the wide array of characters with long, complicated, foreign names all vying for power featured here make HBO's 'Game of Thrones' look like a children's story by comparison. Even with its sometimes overwhelming focus on politics and emotionless battles, 'Kingdom of War: Part I' does indeed offer some entertainment value and effectively lays the groundwork for its slightly more exciting sequel. 'Kingdom of War: Part II' picks up several years after the end of Part I. A now fully grown Prince Naresuan has returned to his home kingdom and after news of King Bayinnaung's death he travels back to Hongsawadi to pay his respects. With the kingdom now in flux, one of the subservient territories takes the opportunity to wage war with Hongsawadi. In response, Prince Naresuan and various allies go to battle to defend the realm. When it later becomes clear that many of these so called allies secretly want Naresuan dead, the Prince takes up arms and wages war with Hongsawadi itself. Since our three core characters are now adults, three new actors step into their roles. Thankfully, all three do a great job of continuing what their young peers started, and offer nice extensions of the personalities we already saw forming in the previous movie. Much more emphasis is placed on action and since Naresuan himself is now actively part of the combat, the battles hold more importance and interest. The director also steps up his game and adds a few stylistic flourishes to the proceedings that give the fighting a nice level of excitement. On the downside, a fair amount of the running time is once again dedicated to long conversations of politics and strategy, though thankfully to a much lesser degree than Part I. In fact, the last forty five minutes of the movie are essentially one long battle scene. Character development is disappointingly sparse though. While there is some attempt at examining the hardships of being a leader who must make tough decisions, Naresuan's internal and emotional journey isn’t given as much emphasis as it should. Also, considering the setup done in the previous film, I expected a bit more interaction between the now adult Naresuan and his love interest Manechan, but the two share surprisingly few scenes. In addition to the action, much of the story is actually dedicated to Bunting's romantic pursuits, as he vies for the affections of a captured Warrior Princess from a rival kingdom. Though a bit clichéd and underdeveloped, there is a certain charm to their romance that plays well on screen. The final battle is well executed and does have some thrilling moments, but the movie ends abruptly with the overarching conflicts still left unresolved. This makes sense though, as surprise, surprise, there is actually a third part to this epic story that was just recently released overseas. This means that there's probably at least three more hours of historical, political intrigue and Prince Naresuan action left to look forward to (or not look forward to, I'm still not sure). While a bit more exciting than the previous installment, 'Kingdom of War: Part II' suffers from a lot of its same flaws and has the ultimately unsatisfying burden of serving as the middle part of a trilogy. Still, once again, there is definitely some entertainment value and the production work itself is certainly impressive. Fans of similar sprawling historical epics may find a lot to like here. 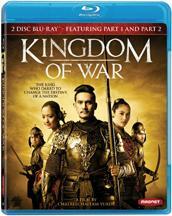 Magnolia brings 'Kingdom of War: Part I & Part II' to Blu-ray on two separate BD-50 discs housed together in a standard case. The discs each contain one of the films with their own selection of supplements. Both titles are also available to purchase separately, and this release appears to contain the same discs from those individual packages. Some skippable trailers play upon startup before transitioning to a standard menu. Both films were part of the same production and thus feature essentially the same technical presentations. Video is presented in a 1080p/AVC transfer in the 1.78:1 aspect ratio and both films look pretty good. The source is mostly pristine, with only a minor speck here and there. Some light grain is also periodically visible. Detail can be very strong, especially in close-ups, displaying every war-weary pore on the characters' faces. All of amazing set design and production art also shine through with sometimes incredible precision. Depth varies from shot to shot, with some looking very impressive, and others appearing a bit flat. Colors seem to be intentionally stylized to evoke a period feel and can be a little muted which isn't always very appealing. That being said, they still offer a nice pop in many scenes. Black levels appear to be consistent but are perhaps a hair elevated, causing a slightly washed out look in some nighttime sequences. Contrast lacks a bit of the punch found in other releases, but has a nice, natural quality. The two movies each look good and are downright impressive in a few specific scenes. One of the major highlights of the films are their attention to visual detail and the transfers thankfully do not disappoint on that front. Both films are presented with Thai DTS-HD Master Audio 5.1 tracks along with optional English, English SDH, and Spanish subtitles. Like the video, both movies feature the same strengths and weaknesses in their audio mixes. Dialogue is the main sticking point here, and often has a somewhat thin quality. Some crackles and distortions are also frequent during speech, though they are pretty faint and don't detract much from the film. Surround use is effective, with lots of activity during the battle sequences sending flying arrows, sword slashes, and even some bullets, all around the soundscape. Dynamic range isn't quite as wide as one might hope, but still good. Bass activity is nice and full, but also a little subdued considering the frequent emphasis on action and explosions. Though there are some minor technical issues, the audio is well executed and does provide a full, enveloping experience. Magnolia has provided a very slim set of supplements for each film. All of the extras are provided in extremely low quality standard definition with Dolby Digital stereo sound and optional English subtitles. Behind The Scenes of Kingdom of War (SD, 8 min) - This is a decent featurette that focuses on the filmmakers' research into historical documents and locations. It also includes some footage and information on the team's painstaking work to reconstruct the magnificent kingdoms seen in the movie. Royal Lineage & Characters (SD, 11 min) - The story's epic cast of characters are addressed, illustrating their complicated connections. Interviews with the actors discussing their roles are also included. This might actually make a good watch before the main feature to help introduce new viewers to the sprawling collection of players involved. Trailers - The film's international trailer is presented in standard definition along with some high definition trailers for other Magnolia releases. Making of Kingdom of War (SD, 8 min) - This offers a more detailed look at the movie's impressive set construction along with interviews with the set decorator, actors and screenwriter discussing the importance of the story and its place in Thai history. Behind the Scenes (SD, 2 min) - A very brief featurette that includes a few more bits from the actors and writer about bringing real people to the screen. The most interesting piece of information learned is that the actor playing the adult Prince Naresuan is actually a Thai solider, not a professional performer. Music Video (SD, 4 min) - This is a music video for a cheesy original English language song written for the movie. 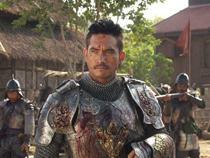 'Kingdom of War: Part I & Part II' is a sprawling Thai historical epic that offers some impressive art direction and battle sequences, but suffers from a dragging pace and a lack of character development. The video and audio presentations are good, though supplements are sparse and mostly disposable. Despite its flaws, this is still worth a look for those who like epic filmmaking.